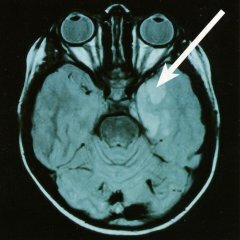 The MRT image shows a benign brain tumour which stands out in a lighter colour against the healthy tissue (see arrow). Such tumours can cause epileptic seizures. Most patients become seizure free after the tumour has been removed.